New Glarus is not, not canning. Here’s what happened… Again. New Glarus Brewing is ACTUALLY canning. It’s complicated. 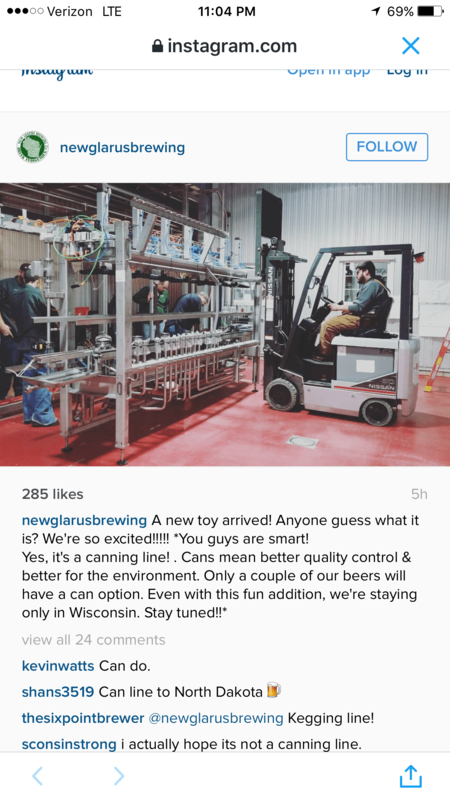 Back in February, New Glarus posted that they were getting a canning line. Due to some unforeseen issues, there was a little bit of confusion. It was, in fact, a KEGGING line. New Glarus posted to their Instagram over the weekend, a picture of a new piece of a equipment in the brewery. They asked fans to guess what it was. Judging by the comments, most thought it was a canning line. To which the brewery or PR person in charge of the account confirmed it was a canning line. That post on the brewery’s Instagram remained unchanged until this afternoon, when they updated it, mentioning their mistake. (See above). For now, it’s a keg line. Sadly, no known can plans for New Glarus. For now. So it seems that New Glarus Brewing Co. will be canning after all. Moon Man will be the debut can release (in 12 packs) followed by Spotted Cow in the near future. Dates are not set yet for when these cans will hit shelves, but summer in Wisconsin looks bright.